In 1612, a dozen people were accused of using witchcraft to murder ten of their neighbors. Two men and nine women, from the Pendle Hill area of Lancashire, eventually went to trial, and of these eleven, ten were eventually found guilty and sentenced to death by hanging. Although there were certainly other witchcraft trials taking place in England during the fifteenth to eighteenth century, it was rare for so many people to be accused and tried at once, and even more unusual for so many people to be sentenced to execution. Of the five hundred or so people executed for witchcraft in England over three hundred years, ten were the Pendle witches. Although one of the accused, Elizabeth Southerns, or Demdike, had been known in the area as a witch for a long time, it's entirely possible that the accusations which led up to formal charges and the trial itself were rooted in a feud between Demdike's family and another local clan. To understand why the case of the Pendle witches took place – as well as other trials of the era – it’s important to understand the political and social environment of the time. The England of the sixteenth and seventeenth century was a fairly turbulent time. The English Reformation led to a split in which the Church of England broke away from the Catholic church – and really, this was more about politics than theology, and was spurred largely by King Henry VIII’s desire for an annulment of his first marriage. When Henry passed away, his daughter Mary took the throne, and reasserted the right of papal control over the throne. However, Mary died and was replaced by her sister Elizabeth, who was Protestant like their father. There was an ongoing battle for religious supremacy in Britain, predominantly between Catholics and Protestants, but also including fringe groups like the new Lutheran church and the Puritans. Queen Elizabeth I passed away in 1603, and was succeeded by her distant cousin James VI and I. James was a highly educated man who was fascinated by the supernatural and spiritual, and in particular was intrigued by the idea that witches might be roaming the country causing mischief. He attended witch trials in Denmark and Scotland, and supervised the torture of several accused witches himself. In 1597, he wrote his treatise Daemonologie, which details how to hunt witches and punish them. When the Pendle witches were accused, in 1612, England was a country in political and religious upheaval, and many religious leaders actively spoke out against the practice of witchcraft. Thanks to the relatively new invention of printing, information spread faster and further than ever before, and the general populace – of all social classes – saw witchcraft as a very real threat to society as a whole. Superstitions were taken as matter of fact; evil spirits and curses were legitimate causes of misfortune, and those who worked with such things could be blamed for any number of problems in a community. Elizabeth Southerns and several of her family members were among the accused. Elizabeth, known as Mother Demdike, was in her eighties at the time, and her daughter Elizabeth Device were at the forefront of the investigation. In addition, Elizabeth Device’s son and daughter, James and Alison, were accused. Allegations were also leveled against Alice Nutter, the wealthy widow of a farmer, Jane Bulcock and her son John, Margaret Pearson, Katherine Hewitt, and other members of the community. March 1612: Alison Device, the granddaughter of Mother Demdike, is out begging, and asks a peddler for some pins. He refuses to let her have them, so allegedly she curses him – and shortly thereafter, he falls down, having a seizure. Alison is arrested and hauled before Justice Roger Nowell, and confesses to witchcraft. Upon interrogation, she says that her grandmother has been practicing witchcraft as well, and was even responsible for using magic to cause the death of a local girl. In addition, Alison says that Anne Whittle, also called Chattox, is a witch too, and caused the death of an innkeeper’s son with a clay doll. April 1612: Nowell orders that Demdike, Chattox, and Redferne be brought in to testify, and Demdike confesses to practicing witchcraft. Nowell sends the three of them, along with Alison Device, to Lancaster Castle to await trial. Several of Demdike’s family members meet at Malkin Tower – the Device family home - to figure out how they can help Demdike and Device, and Nowell later deems this meeting a gathering of a witches’ coven. Meanwhile, Demdike’s daughter, Elizabeth Device, and her children, James and Jennet are brought in for questioning. Nine year old Jennet tells Nowell the names of those who were present at the family meeting, as well as Alice Nutter. All of those named are sent to prison, but Demdike dies before the trial takes place. August 1612: When the trial opens, Nowell brings Jennet forth as a witness, and she testifies against her relatives and other village residents, none of whom have a defense attorney. Elizabeth Device is removed from the courtroom when she begins screaming at her daughter and cursing Nowell. Chattox asks for mercy and forgiveness for herself and for Redferne. Alison Device faints when the peddler appears to give evidence against her, but later confesses to cursing him. Nowell finds all of them guilty. On August 20, a crowd gathers at Lancaster Castle to watch the public hangings of Chattox and Redferne, as well as Elizabeth, James, and Alison Device, Alice Nutter, Katherine Hewitt, Jane Bulcock and her son John, and Margaret Pearson. In 1634, a woman named Jennet Device was accused of witchcraft in Lancaster, and charge with the murder of Isabel Nutter, the wife of William Nutter. Although it’s not clear whether this was the same Jennet who testified as a child against her own family members, she and nineteen other people were found guilty. However, rather than being executed, their case was referred to King Charles himself. Upon cross-examination, the one witness – a ten-year-old boy – recanted his testimony. The twenty accused remained in jail at Lancaster, where it assumed that they eventually died. Much like Salem, Massachusetts, Pendle has become famous for its witchcraft trials, and has capitalized on that notoriety. 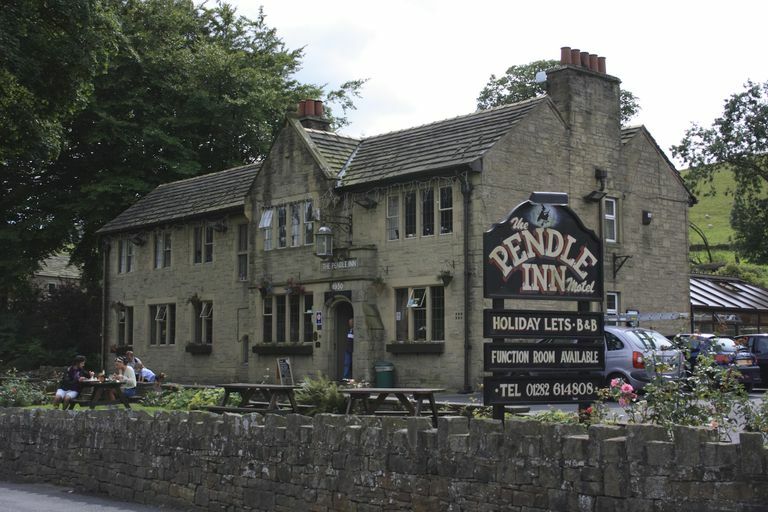 There are witchcraft shops and even guided tours, as well as a brewery that makes a beer called Pendle Witches Brew. In 2012, the 400th anniversary of the trial, an exhibition was on display at nearby Gawthorpe Hall, and a statue was erected in the memory of Alice Nutter, near her home in the village of Roughlee. In 2011, a cottage was unearthed near Pendle Hill, and archaeologists believe it could be Malkin Tower, the home of Elizabeth Southerns and her family. For a fascinating look at the trials, you can read The Wonderfull Discoverie of Witches in the Countie of Lancaster, which is an account of the events by Thomas Potts, the clerk to the Lancaster Assizes. If you’d like a perspective on the social and cultural environment that made seventeenth-century England ripe for accusations of witchcraft, read Witchcraft Beliefs in Early Modern England, over at the online history community, All Empires.